There are villas to choose from all across the island, and more popping up every month. Some of the standouts for me were Villa Azure, a bright villa with terrific common areas indoor and out and mesmerizing sea views and direct access to the best snorkeling. Shoal Bay beach is also within view, and got the vote from the locals I spoke to as the most beautiful beach on the island. Villa ALZ ALZ was a full retreat with pool, Jacuzzi, tennis court, and beach access. This villa is set among gorgeous mature gardens and has a spectacular view of Barnes Bay, complete with a Pelican that I swear they paid to hang around for our pictures. This villa has a ton of personality with its separate living areas and Indonesian antique furnishings. 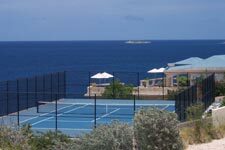 Anguilla is really a haven for tennis lovers, with most of the resorts and many of the villas offering courts. One remarkable villa with a tennis court is RIC DES. The highlights of this villa are the infinity pool whose drama is magnified by the villas cliffside location. The tennis court also boasts a view that most home builders would kill for. We were lucky to get a tour from the villa owners who gave us the history on the stunning building materials used - polished Anguillian rock and fossilized coral rock. No need for art on the walls here…the walls are art enough! One other villa that I expect to be very popular is Villa Sandcastle, brand new and ready to rent in September 2007. 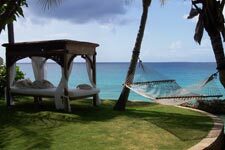 I loved the location of this villa on Crocus Bay and just steps from the beach. It is a very quiet location. The villa itself was designed to be lived in so guests can enjoy the gourmet kitchen, large closet areas and fantastic outdoor kitchen. Overall Anguilla had a great feel of casual elegance. It's a casual island with incredibly kind, friendly people who love the slower, quieter pace of their island. The accommodations on the island are outstanding though, offering guests a peaceful retreat in beautiful well-appointed surroundings. Oh, and did I mention the food? Beyond our culinary treats prepared by our chef at Sheriva, we enjoyed an authentic Northern Italian meal at Caprice, homemade pasta and fresh seafood. It was all just mouthwatering. We also had a very fresh lunch at Cuisinart where the chef incorporates ingredients from the onsite farm. The most entertaining meal was at Georges at the Cap Juluca resort for their International Chefs Challenge. All the tables are set up with candlelight right on the beach. There is live music and 3 chefs competing for your taste buds by preparing dishes from their country. It’s a lot of fun and you just can’t beat the location! 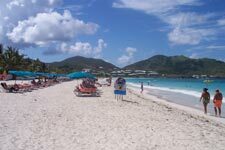 Back in St Martin for 2 partial days, we wanted to make the most of our time by getting a good feel for the island. After checking into the Beach Plaza Hotel in Marigot we jumped in a rental car that Value Car Rental delivered right to the hotel. Up and over the hills we headed to Grand Case which is near the airport. 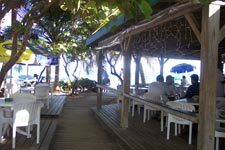 This is a great strip of restaurants and beach bars along Grand Case Beach. The Calmos Café was busy with lots of people lying in their beach chairs out front. A lot of the other restaurants looked awesome but weren't open until dinner. At the end of the beach are the Grand Case Beach Club and Villas C GUI and C ROC. Over another hill and we came upon Orient Beach which is a terrifically active area. The area between the main road and the beach reminded me of the hills of California with villas and homes nestled in lush gardens. This is where the Green Cay Villas are located. Down at the beach you have your choice of beach bars to try out, and lots of cool watersports for when you get restless. The water is gorgeous and we just couldn't resist a swim. Heaven on a hot day! We drove a full loop around the island through French and Dutch territory and it didn’t take long at all, although this is a busy island and we did hit some rush hour traffic. Our last stop before returning to the hotel was at Dawn Beach where Villas JPS GIA and JPS BLM are located. We settled in for a sunset cocktail at Mr. Busby's Beach Bar where we had a full view of St Barts, our destination for the next day (assuming the hurricane stays south). We toured some of the villas in the Baie Rouge area of St Martin. This is a great area because it is purely residential (except for La Samanna hotel) and has access to wonderful beaches. It's quiet but also very convenient to the lively commercial areas for dinner, shopping and entertainment. The villas themselves had some consistent themes, large bathrooms with stunning colored tiles, easy flow between bedrooms and living areas, and a great central outdoor pool terrace. Villa C Lab is a great new hillside villa with 7 bedrooms and is walking distance to La Samanna for lunch and dinner. Villa C ADO had spectacular 180° views from its large terrace - a perfect villa for watching the Heineken Regatta each March. Villa C BER has a great outdoor area with a 2-level pool complete with waterfall and built-in game table and 2 hammocks overlooking the sea. On the exclusive Baie Rouge beach is villa C ALM which was full of activity as the staff was readying it for the arrival of clients that day.